Nations Press feature news Pregnant Man give Birth! Thomas Beatie, garnered international attention as the first transgender man who gave birth in 2008 and made him popular known as “The Pregnant Man”. But,aside from Beatie, a Chinese man has stirred the World Wide Web as the new ‘Pregnant Man’known by his name Zhang Chan, 33 years old, and is obviously not happy about his new title. It turns out that his title is only a metaphor for the growing lump in his stomach, which he discovered over a decade ago. It started in 2004, where he complained of a discomfort in his stomach. Two years later, doctors reported of a growing lump inside his stomach. By 2011, the lump had grown to the size of a beach ball. Doctors and physicians told him that removing it would be too dangerous. The tumor had already pressed on his internal organs, particularly his bladder and intestines as it continuous to grow. In the beginning of 2016, his family raised enough money for his operation and a six-hour procedure was finally carried out in the Military General Hospital last April. 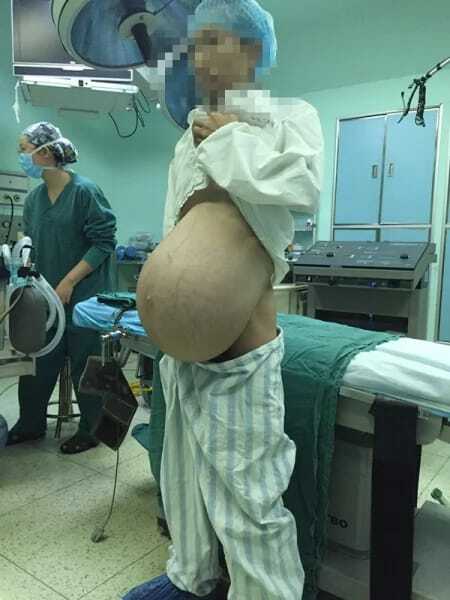 Dr. Dai Ruiwu, the lead surgeon of Chan’s operation, successfully removed the humongous tumor which weighed 33 pounds.